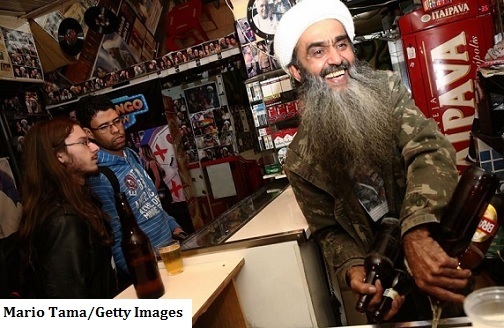 Ceará Francisco Helder Braga Fernandes may be a Christian from Brazil, but his passing resemblance to Osama bin Laden inspired him to follow his dream – to open an Al Qaeda-themed pub in his native Sao Paulo. who are busily learning English, French and Italian, he expects to do a brisk business when throngs of Europeans descend on the city for the FIFA World Cup next month. Oddly enough, a bar run by suicide bombers would probably be safer than actually walking around Sao Paulo at night, and I’m still amazed by the fact that Brazilian gangs have been known to take over entire apartment complexes to ensure a more thorough robbing experience. Then again, the city’s per capita murder rate is lower than that of Chicago or New Orleans, so maybe the city gets a bit of a bum rap. Maybe now that Ceará has blazed the trail, other business owners will follow with edgier establishments. Instead of another stupid Cracker Barrel with kitsch and Americana on the wall, maybe we can loosen up and live a little. And maybe the goddamned Small Business Administration will finally give me a loan so I can open the Vlad the Impaler-themed kebab restaurant I’ve been pitching for years instead of just sending me the same stupid rejection letter over and over.